Our regular magazine Turn Left only appears at traditional Brighton Rockers home games, but we put together a special eight-page mini-mag for Sunday’s epic Derby Sevens event hosted by the Rockers. Click on the image above for the online version of it, or pick up a physical copy on the flyer/games shelves in Brighton’s Evening Star and Bierhaus pubs. Special thanks to all our lovely interviewees, photographers and awesomes advertisers. Or click below if you want to check out our short (3’40”) YouTube vlog on the event. Yay! OMG They Made Roller Derby EXTRA CHAOTIC! 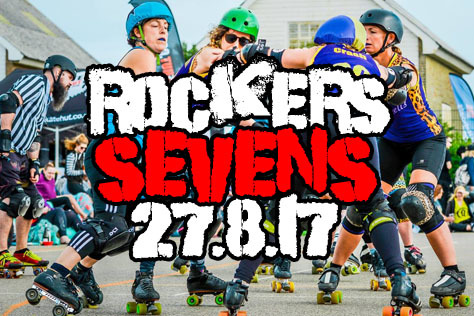 Get To ROCKERS SEVENS This Sunday! It’s taking place this Sunday, the 27th (a date that ends in the number SEVEN) of August at the Dolphin Leisure Centre in Haywards Heath, with doors from midday and a roughly 6pm finish time. Tickets are priced (in keeping with the theme) at SEVEN pounds for adults, free for under 12s. Get yours from the link at the bottom of this piece. They should be available on the door too. The venue is almost exactly SEVEN minutes walk from Haywards Heath train station – turn left and head on in that direction, following roller derby signage attached to lampposts, dogs and passers by. There’s a decent enough pub (The Burrell, which is SEVEN letters) opposite the station, and a big Sainsbury’s roughly halfway between the station and venue (it shuts at 4pm on Sundays but has an ATM outside – there’s no ATM at the venue). There are bar facilities in the venue and bringing in booze from elsewhere is very much frowned upon. There will probably only be SEVEN bottles of London Pride in the fridge though, and we’ve bagsied five of them. Just saying. The official after party is at the East Street Tap in Brighton. Whose address is 72 East Street. 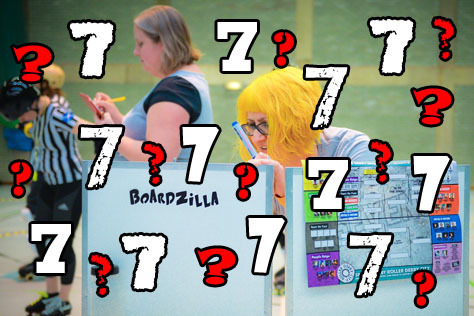 Which is a number that starts with SEVEN, yeah? We only produce our fanzine Turn Left for traditional Rockers home games, but we made a late decision to do a one-off mini-mag for this event. Pick it up on the door. It’s exactly SEVEN pages long (if you don’t include the cover). The venue for today’s game is itself in one of Mancunia’s distantest suburbs. The evocatively named Urmston is home to the George H Carnall, a small but perfectly formed leisure centre attached to a school. Few Rockers make it across the plains of Stretford in time to catch the start of the men’s game that precedes their own. The Manchester league is home to several flavours of derby (women’s, men’s, co-ed) and their geezers A-team New Wheeled Order are taking on Team Boy Division here. The latter is a team assembled from members of various other (mostly Northern) men’s leagues. As one would expect, the Manchester side are better organised than their mixed league opposition, although Boy Div have a lot of very strong individuals in their ranks. The visitors are playing with a very small jammer rotation here (3-4) with some players you might have expected to star up, such as Southern Discomfort’s Shrooms and Inhuman Leaguer Doug Hisgrave, sticking to defensive duties. 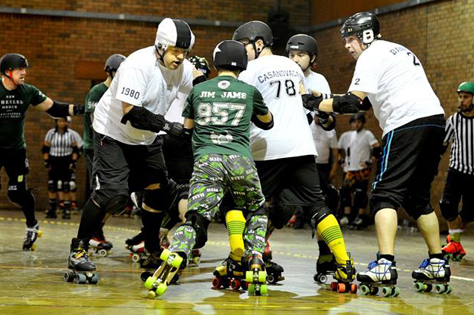 The pyjamas-legged Jim Jams and Lt Damn are among the home team’s most dangerous jammers. Though NWO are on top for much of the first half, their lead at the break is fairly slender (91-59). The Brighton players have spent much of the multi-car journey up here trying to guess what music was playing in the other vehicles based on their occupants’ dancing. Now it’s time to get serious, celebrating the relative novelty of a derby venue having lockers, before finding out if the skating surface is as slippery as advance warnings have suggested. With their practice laps complete, the Rockers entourage take to the bleachers for the second half of the men’s game. Just ten skaters here for Brighton, along with bench coach Mistress and line-up manager Racey. The latter caused something of a fluster in UK derby’s counter-clockwise circles earlier this year with a blog post that suggested (not unreasonably) that not every single advanced boot camp should be purely co-ed. Some people took this post to mean that she wanted all male derby players to be castrated, before being thrown onto a bonfire that she would personally dance around, laughing maniacally whilst reciting feminist poetry. Security are understandably keeping an eye on her, but Racey somehow resists the temptation to Emily Davison herself under the NWO pack, and has an alibi for the incident that sees Lt Damn spend several seconds face down on the track. The Manchester men take the win 165-102. The last (and only previous) time Brighton took a small mixed level squad to an open door away game, in Lille earlier this year, they were beaten fairly convincingly. The rankings would suggest that something similar is on the cards here today. Manchester are only five places behind Brighton’s All-Stars in the European table, suggesting that even the full Rockers A-team would be in for a very tough battle here. It’s not that Brighton are underestimating their opponents, just that at this time of year, with many players taking breaks from skating or otherwise occupied, these are the only game-ready travelable players the Sussex league have at their disposal. There would have been eleven here, as it happens, but a slight knock caused the late withdrawal of a temporary transfer from French Canadia. With just ten in the squad, two distinct line-ups of five is the obvious way to go. One of these contains Enyo Face, Kapow, summer transfer Swann, highly rated rookie Obliviator, and a recent transfer from Finland, Harriet Hotter. The other features Rose Bleed, Chaka Carnage, Emma the Condemner and Irish Mist, along with Gin Atomic, here making her Rockers debut after recently joining from near neighbours Croydon. 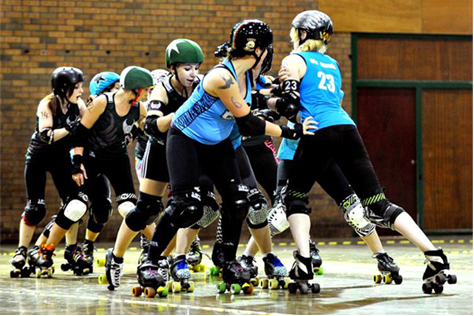 There’s something of a North-South divide in English roller derby, one that is particularly felt if you’re based as far South as the Rockers are. You get to know players from other leagues through taking part in scrims and watching other games, and for Brighton’s players that ‘circuit’ barely extends to Birmingham, let alone further up the country. Consequently, all that the majority of the Rockers know about Manchester Roller Derby can be summed up in three words: Vic Tori Bee. The England training squad member and Queens Of The Sin Bin sponsored skater is one of the rising stars of UK derby and, as expected, will prove to be Brighton’s tormentor-in-chief here today. 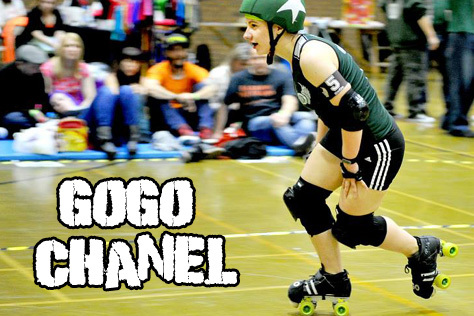 Tori is part of a small MRD jamming roster, alongside GoGo Chanel and Smack Mamba. Even though Brighton only have ten skaters, they’ll stick with a typically large starhead rotation: Obliviator, Kapow and Enyo for one line-up; Gin, Emma and Rose for the other. Indeed, all ten Sussex skaters will get at least one outing in the star, although in some cases not for long – Irish Mist passes the star over the pack straight from the whistle when it’s her turn! Brighton are going into this game with fairly low expectations, having had very few opportunities to practice these line-ups in advance. Indeed Gin, who only joined the Rockers a couple of weeks ago, has only skated alongside Rose once prior to today, and that was at England tryouts. We’re not sure whether this explains the debutant picking up five penalties in the first half, though, but a clean second sees her stay in the game. The Sussex side are a good match for the hosts in the early running. Although Manchester are first to put points on the board, high scoring jams from Enyo and Gin see Brighton leading 45-40 five jams in. Sadly it’s not to last – the small rotation and long journey (most of the team have been up around 12 hours now) will take a toll, as will the all round strength of the MRD Checkerbroads. Obliviator is putting in a strong and determined performance. She looks a little bewildered by the jammer-on-jammer hits Tori Bee throws her away – not something she’s encountered before – but holds up well. During the warm ups, the Rockers had identified the imposing Psycho Sis as an opponent to beware of, and the powerful blocker metes out hard hits to meet those expectations. With Emma off for a track cut, Tori puts in a 20-point jam and the hosts go into half time 110-69 up. While the skaters take a break, the infield is given over to some bizarre Northern pastime that involves rubber ducks. It’s best we don’t explain further. Quite a partisan home crowd here, as one would expect, and the Checkerbroads have them cheering further as they win all but one of the second period’s first nine jams. A knock to Enyo sees her having to sit out three jams, temporarily reducing Brighton to a single digit squad. Manchester varying their rotation a little, giving Iko and Sirenide a turn in the star. Rockers putting Swann into jam more now, with Chaka and Harriet also getting star-clad cameos. 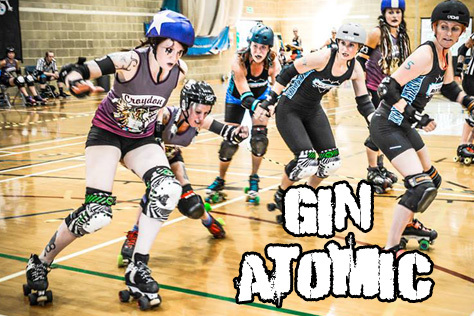 The latter’s debut in the Brighton star doesn’t quite go according to plan, as she manages to pick up four jammer penalties in a single outing – Sirenide clocking in 22 points in the process – but the game has long since drifted out of the Rockers’ reach. GoGo has been a particular menace to the Sussex side, whilst the blocking of Psycho and captain Price has kept Brighton’s starheads at bay. The captain picks up the Best Blocker award, with Jammer going to Vic Tori Bee and MVP to Smack Mamba. Best take out (the hitting kind not the food kind) goes to Kate Push for spectacularly upending Gin at high speed. For the Rockers, Kapow picks up Best Jammer, Swann takes the Blocker award and Gin picks up MVP on her Brighton debut. Rose wins best take out, despite insisting she’s never taken anyone out ever. 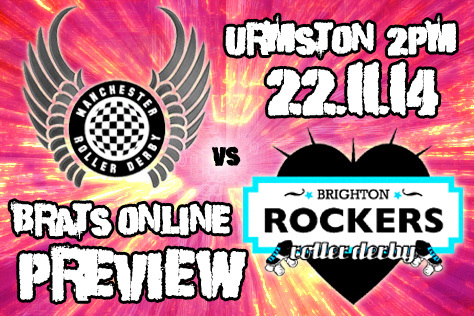 Final score: Manchester Checkerbroads 243 – Brighton Rockers (mixed level) 115. The Rockers will miss much of the after party as they have to go back to their hotel first. As we’ve already established their hotel is so far out from the centre it’s practically in Wales. Whilst waiting for taxis to the party, they toast their defeat with Prosecco served in teacups. Stay classy, Brighton. Despite the result, it’s been a productive trip, giving a lot of newer players a chance to line up with established stars in a competitive match. With the numerically limited Sussex league having to put together a tournament roster of 20 for next year’s Championships, some players from outside of the Rockers’ traditional A-team fourteen will be getting a chance to shine. General consensus is that Obliviator in particular is a potential star in the making – a few days after the Manchester trip she will pick up the league’s Skater of the Month award. For now, she joins the rest of the Northern expedition in the Courtyard, a crowded student sports bar in Central Manchester. The long day catches up with the Sussex squad, who bow out of the noisy pub early for the relative sanctuary of a nearby Nando’s. The next day sees a sauna and swim before the journey back South, although a serious problem with Rose’s car means a somewhat longer vacation in the fields of Didsbury for some of the Brighton crew. The Rockers round off 2014 with a mixed scrimmage in Hove, featuring a lot of skaters from the Croydon and Eastbourne leagues alongside Rockers and others. It’s a real nailbiter and goes to an overtime jam – a steward’s inquiry will later reveal some creative score tracking at work to make the scores level at full time. So onto 2015 then. What’s happening next year? What’s happening is the first ever British Championships, that’s what. A whopping 72 women’s teams in thirteen divisions (plus three men’s divisions) forming probably the biggest league programme in world derby. The lowest tier features six divisions of five teams each. Above that four divisions of six teams. Then the top two tiers, which are for UKRDA member leagues only. 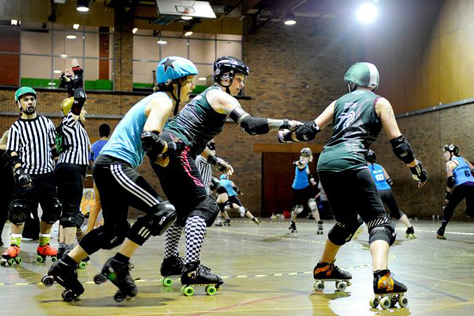 The top division features powerhouses Glasgow Roller Derby, Auld Reekie (Edinburgh), Tiger Bay (Cardiff), Middlesbrough, Rainy City (Manchester) and Central City (Birmingham). Brighton wouldn’t look out of place in such a division, having beaten two of those teams, lost to three and never met Tiger Bay. For now the Rockers start, as do Manchester, just below in one of the two tier two divisions. Manchester are the lowest placed team (22nd in the UKRDA rankings) in a very strong National North division, where they are up against Leeds (6th), the other Leeds league Hot Wheel (7th), Newcastle (12th), Nottingham’s Hellfire Harlots (14th) and Hull (20th). Such is the strength of Northern leagues – note that there’s no Southern sides in the very top division at all – that the National South division looks marginally weaker by comparison. 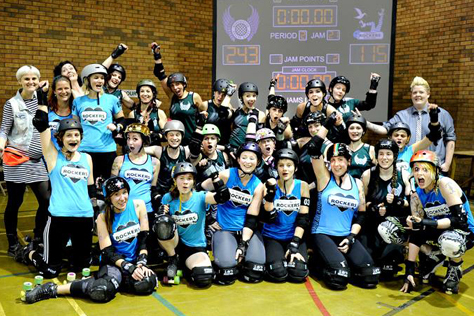 Brighton are actually the highest ranked side in the division (9th) and will be facing Royal Windsor (10th), London Rockin’ Rollers (13th), Portsmouth (15th), Southend’s Seaside Sirens (19th) and Bristol (25th). Brighton have the upper hand in games v LRR, Portsmouth and the Sirens, have won one and lost one v Bristol, and have surprisingly never met Windsor. The 2015 Rockers roster is going to be fairly different from that which has brought the league to their current position in the rankings, so it should be an interesting tournament. All game days are double headers apart from the final day which is a triple header. This means (we think) that Brighton will play one home game and four neutral/away. There will be other non-Champs games next year too, although we suspect the Rockers might try to avoid playing potential Champs opponents in these (they could face the National North sides in play-offs). Overseas opposition seems quite likely. The Rockers ‘owe’ Gent a rematch in the UK and are similarly due a trip over to Paris – neither of these would surprise us. Who else? Hmmm… Whilst we consult the rankings sites to guess potential opposition, grab yourself a mince pie and a pint of brandy – or whatever people are supposed to drink at Christmas – and we’ll see you in the New Year. Merry festives one and all.